Even though children are spending more and more time on computers, games and other screens, children and their families still value reading as a very important activity. Parents love reading to their young children; teens love escaping into a book. But as I think about the transformations that are occurring within the publishing world, I wonder about how this experience with reading is changing as we enter the new print + digital landscape. For more on Literacy 2.0 and reading with your children, check out the Share a Story / Shape a Future event. Bloggers across the Kidlitosphere are writing on this topic today. The iPad and other full color tablets like the Xoom are quickly changing the way young children can experience digital books. For a long time, picture books have been available on computers, but that format is more difficult for young children. The iPad lets little kids hold the digital book in their hands, up close. More than that, it allows young children to interact with a book in some similar ways they interact with a printed book, and in some new ways too. 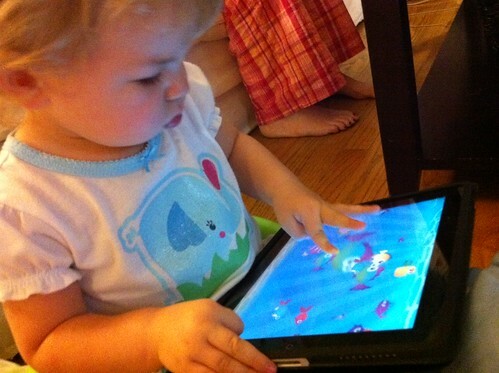 Many eBook apps are being developed of the iPhone and iPad which add touch screen interactive quality to picture books. These eBook apps typically combine narration, text highlighted for children to track and practice their reading, touch screen features, and perhaps games or additional materials. You can cuddle with your child and read the book together, and then they can read it on their own with the narration. Middle grade and teen readers are starting to buy eBooks for their pleasure reading. Several publishers have noted that sales started increasing after the 2010 holiday season, perhaps indicating that children were starting to get their own Kindles, Nooks and other e-readers. 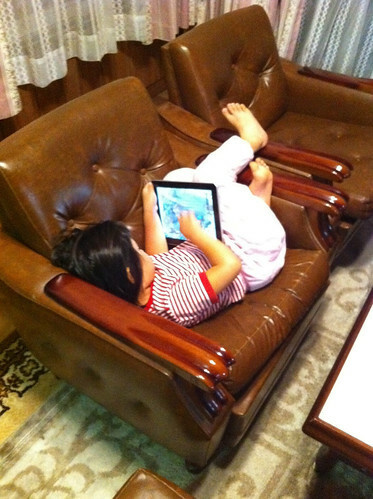 While many kids are enjoying experimenting with e-readers, children's reading habits are different from adults. Most notably, children read many more books than adults, typically reading two to four books a month. Children also use their school and public library much more than adults. While public libraries are experimenting with making eBooks available through providers such as Overdrive, this is at the early stages and large library systems still only have a few copies. Soon, however, the price of e-readers will come down, and tweens and teens will start reading more eBooks. I have noticed that many kids don't worry about the format of the story. As long as it's comfortable to read, what they really care about is falling into a story they can relate to, a story their friends are talking about, a story that hooks them. And kids want to be able to find the story they want to read quickly and easily. They're not going to spend a lot of time negotiating the library website, downloading a book to the computer, and then transferring it to their device. As I watch children around me start to experiment with reading on different digital devices, I think there are some important things to keep in mind. Yes, the story is the most important thing they care about. Does it capture their imagination? But their experiences also shape their expectations. As they read interactive eBooks, they come to expect their stories to react to their motions. I think children will be adept at making print books react in their imaginations by adding sound effects and zooming books around. But on screens, their experiences will reinforce their expectations. Children's reading experiences need to help their developmental process. Young children need print to be large and spaced so they can identify individual words easily. Older children enjoy larger words, but they also need help decoding unfamiliar words. Older readers would enjoy using a feature which would say aloud and define words they are getting stuck on. Our children are reading voraciously, both for their own pleasure and as part of school assignments (for a fascinating survey, read about the recent survey by the Association of Booksellers for Children). They will read both print books and digital eBooks. The question for parents is how can we support their reading experiences so that they enjoy reading? After all, the old saying is true: the more you read, the better you get, and the more you enjoy it. I think there is a definite place for both digital and print books. I also believe the important thing as you say is for parents to be involved in the choices and in the reading. So long as kids are reading and engaged with appropriate, quality literature, I'll be delighted! "As long as it's comfortable to read, what they really care about is falling into a story they can relate to, a story their friends are talking about, a story that hooks them. And kids want to be able to find the story they want to read quickly and easily." The format is changing, but clearly the sentiment is timeless. There is a place for both digital and print, and your observations about readers expecting more bells and whistles on their books is fascinating - if not frightening - to me. Will we lose the pleasure of letting our imaginations make the sound? With my own 9YO I see this need for near-constant stimulation. What happens when it comes TO her instead of her own experiences driving it? Only time will tell, I guess. For the first time this week, at our local fitness center, I saw two people reading Kindles while riding the exercise bike. This is a tell tale sign that things are changing. My wife and I watched iPods start showing up in greater numbers a few years back (we would actually count!). So, I agree things are definitely changing for books. I've actually quite enjoyed using my NookColor with my kids, but it's not the only way I choose to read to them, especially since the books are limited. So yes, it's definitely about finding what works best for the children in your life. I thought the point you made about older readers was interesting. As I don't have older kids (yet) and the ones I do have interactions with are voracious readers with their own Kindles, I wonder how other tweens/teens would handle having their own eReader. Would they enjoy reading more or less? I guess it all depends on the person. Fantastic points and some excellent eBooks as well! Thank you so much for participating today! Thanks so much for your comments. I really appreciate them. It's fascinating watching our children adopt technology, seeing what's interesting to them, what promotes their learning. There are great possibilities with digital books - the key is for parents not just to use technology as entertainment. Technology is getting so advanced these days. Ipods , Ipads , e book , mobile phones etc have changed the learning techniques and mage them a lot simpler.what do you think ?? Very nice article, thanks for posting it. As an author-illustrator, the creative possibilities of ebooks/apps are inspiring. There are so many interesting ways to use interactivity...to demonstrate a concept, hide then reveal something, show what's underneath the surface, etc. Am writing down ideas in ever-lengthening lists! I think it is great to see someone trying to tackle the issue of ebooks for children. I work for a children's publishing company so i might be slightly bias but i believe digital books can be a great addition to children's learning. Our books are very colourful and image full, we believe this keeps children interested Our ebooks on the Ipad are also like this which makes them look very stunning on the colour screens! They are also very nice educational and rewarding tools, children can do any number of things with the ebooks that they perhaps couldn't with a printed book! However i think it should go hand in hand with traditional publishing, not push it out!